Your daily scoop of what State of the Union is watching today, April 24, 2014. 1. Crisis in Ukraine. 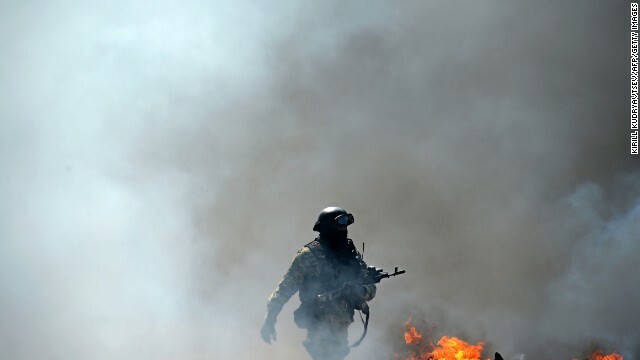 Tensions are escalating as Russia launched new war games on its southern border with Ukraine after Ukrainian forces said they killed five pro-Russian militants. President Obama said Russia appears to be ignoring a truce deal agreed to last week by the U.S., Russia, Ukraine and the European Union. "We continue to see militias and armed men taking over buildings, harassing folks who are disagreeing with them, and destabilizing the region, and we haven't seen Russia step up and discourage that," Obama said Thursday in Tokyo. But Russian Foreign Minister Sergey Lavrov says the West is unfairly blaming Russia for Ukraine's unrest. "We don't have any doubts that the first step must be done by the Kiev authorities," Lavrov said. 2. Flight 370 mystery. Forty-nine days into the jetliner's disappearance, Malaysia's prime minister isn't ready to declare its 239 passengers and crew dead. "At some point in time I would be, but right now I think I need to take into account the feelings of the next of kin and some of them have said publicly that they aren't willing to accept it until they find hard evidence," said Najib Razak in an exclusive interview with CNN. Najib also said the Malaysian government will release its preliminary report on 370's disappearance next week. 3. Pipeline politics. Last week the Obama administration announced it was delaying a final decision on the Keystone XL Pipeline, but according to Rolling Stone Magazine, President Obama has basically made up his mind. In the magazine's May 8th issue, journalist Jeff Goddell writes, "two high-level sources in the Obama administration told me recently that the president has all but decided to deny the permit for the pipeline - a dramatic move that would light up Democratic voters and donors while further provoking the wrath of Big Oil." It is widely believed the administration's decision to delay an announcement about Keystone because of legal challenges involving the pipeline's route, means the issue won't be resolved until after the midterm elections. Republicans and some Democrats who support green-lighting the pipeline have slammed the president for not already announcing a decision.